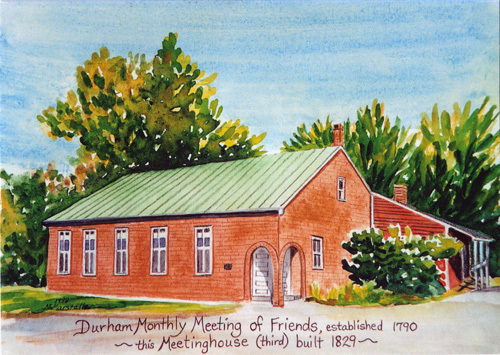 Durham Monthly Meeting last did a proper history in 1929, on the occasion of the 100th anniversary of the current Meetinghouse. It was written by Hattie O. Cox. Each year, the Meeting prepares a State of Society Report in which we take stock of ourselves. Such a report “should be a searching self-examination by the meeting and its members of their spiritual strengths and weaknesses and of the efforts made to foster growth in the spiritual life. Reports may cover the full range of interest and concerns but should emphasize those indicative of the spiritual health of the meeting.” Below, moving backwards in time, are our recent State of Society Reports. In 2017 the State of our Society at Durham Monthly Meeting of Friends was strong, vibrant and energetic. 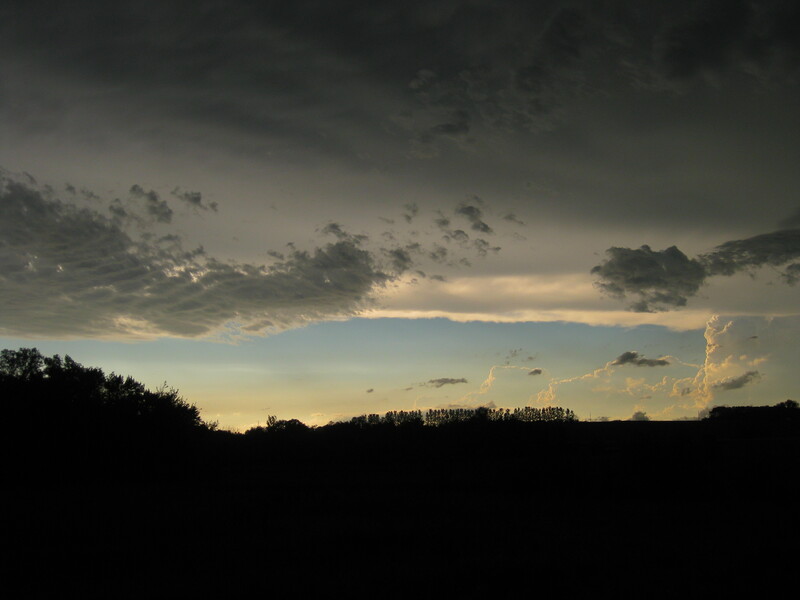 Our trust in our community and shared Quaker faith led us to explore new terrain with hopefulness, trusting that more Truth would be revealed to us through expectant waiting, spiritual faithfulness and good stewardship. We took a risk early in the year, agreeing to explore becoming an un-pastored meeting. Ministry and Counsel guided our path through a number of listening sessions, surveys and called meetings to help chart our course and measure our community needs. While we had grown to see ourselves as ministers among ministers, we wondered whether we were ready to take on this responsibility more fully and without a pastor to guide us. Ministry and Counsel coordinated and arranged for spoken ministry by meeting members and the wider spiritual community. This experience has resulted in a growing number of members of our community feeling led to speak more regularly, which has become a deeply rewarding part of our corporate worship. We continue to be moved and inspired by the variety of voices and messages. A Clerks’ Committee was developed which met bi-monthly to help support and encourage communication and coordination within the meeting. This group was successful at building stronger connections and mutual support across committees and with the presiding clerk. Another Spirit-led effort was the successful completion of a project involving the installation of a new roof, a solar installation to meet our electric needs and a heat pump for a portion of the meetinghouse. We are incredibly grateful to the NEYM, Obadiah Brown’s Benevolent Fund and Friends General Conference Green Meetinghouse Fund contributing 60% for the costs of this project, helping us meet our commitment to reducing our carbon footprint and living as an example in our community. The completion of this $50,000 project was recognized with a ribbon-cutting in June. We look forward to many years of sunshine warming both our bodies and our souls! We were cheered by another year of increasing membership, adding four new members and two children. We are delighted by a growing number of new attenders and families that have become a regular part of the meeting. Attendance at worship was generally 30-40. Peace and Social Concerns Committee took on welcoming many of our new attenders, inviting them to special dinners throughout the year, which were filled with warmth and good conversation. First Day school for both children and adults continued to meet regularly. The Christian Education Committee offered a number of gatherings and activities to encourage family and inter-generational involvement. Godly Play continued as an inspirational curriculum for the young children, along with First Day School for young Friends. We continued to support our highly capable Youth Minister, involved in family ministry and we also hired a childcare worker to assist with the younger children. The adult hour included a variety of topics including discussions, of NEYM Interim Faith and Practice updates, and a very popular fourth-Sunday series featuring a different member’s spiritual journey each month. In other areas, our Woman’s Society remains an important catalyst for many good works, including a monthly meal for a local homeless shelter, ministering to our home-bound friends, and supporting projects for the United Society of Friends Women International. A new Men’s Group came together, meeting for discussion and companionship. Energy converged to bring new life into our website, for which we are deeply grateful, and we remain thankful for many individuals in the meeting who are involved in service and action as well as numerous Quaker-affiliated groups. As the year ended, we drew together once again for a series of listening sessions to guide our discernment of the meeting’s needs and direction. Are we on the right path? What is our vision? How can we best meet our needs and work toward this vision? We look to 2018 with awe and wonder… and with faith we will be led to our unique Truth. We continued to appreciate the leadership and caring concern of Doug Gwyn, our part time “minister among ministers.” In addition to thoughtful and inspirational messages brought by Doug and others, friends continued to enjoy selecting hymns; prayers of joy and concern were abundantly shared and a variety of youth stories were included in our Meeting for Worship, including Godly Play presentations for children and youth during the celebrations of Christ’s birth and resurrection. Doug conducted a helpful workshop on the spoken ministry. The Pastoral Care Team continued to answer needs as they arose. Ministry and Counsel produced a paper on prayer in meeting and in our personal lives. Membership increased by 4 persons; the average consistent attendance at meeting for worship was 38. If all local members and attenders were present, we would have about 60 in attendance. In order to keep our membership list up to date, we dropped 27 members who have been inactive for many years. Our total membership is now 104. 68 are resident members. Our Youth Minister, Wendy Schlotterbeck, continued to effectively serve the meeting by her work with youth. The loss of several youth through graduation redirected her efforts to involving families with younger children. We appreciate her emphasis on environmental and social concerns as she and the youth represented the meeting in many efforts to effect positive change in our society. “Godly Play” continued to be the Sunday School curriculum for children, which met the first and third Sundays. The Youth Class discussed Quakerism and current justice issues. The Adult class met every week, with regular attendance of faithful members. Doug Gwyn led a series on the Gospel of John; Most of the year was spent reading and discussing the book, The Powers that Be by Walter Wink. A popular part of the Adult Sunday School hour was the inclusion of spiritual journeys of members and attenders on the fourth Sunday of the month. Other activities of the Meeting included a rousing song fest with Peter Blood and Annie Patterson; several planned friendly eight dinners in homes; holiday pot luck dinners, and the traditional annual Kakamega Dinner supporting the Kakamega Care Center in Kenya. Also we continued to be in contact with our sister Meeting, Velasco Friends Meeting in Cuba. Our extensive garden at the parsonage has flourished thanks to very hard workers; we were pleased to receive a gardening grant for 2017. A newly established Clerk’s Committee met regularly to integrate and coordinate Meeting activities. “Coffee hour” after Meeting for Worship is a splendid time for social interaction and enjoyment. The Trustees have been inspired to study the possibility of installing solar panels on the roof, and a more efficient heating system. They have received financial grants for this purpose. Rugs in the meeting room were removed and the floor underneath was refinished; matching wood was installed in other areas resulting in a beautiful floor for the whole room. We appreciate their diligence in maintaining the property. One vibrant group which continued to meet is our Woman’s Society, meeting on the third Monday of every month. They provide meals for a homeless shelter once a month, contribute to United Society of Friends Women International projects, and support a ministry of Christmas boxes to many in our meeting and others in need. Some Friends attended the USFWI Triennial gathering in Iowa. We are thankful to have members and attenders who are active in Lisbon Area Christian Outreach, Maine Council of Churches, Falmouth Quarterly Meeting, New England Yearly Meeting, Friends General Conference, Friends United Meeting, Friends Committee on National Legislation, Friends World Committee for Consultation, and Quaker United Nations Committee. At the Ministry and Counsel annual retreat in August, Our pastor, Doug Gwyn, announced his resignation to assume a position at Pendle Hill. His ministry and teaching were much appreciated, and he will be greatly missed. His leaving prompted Ministry and Counsel to consider an adventure of being pastor-less for a period of time, and also evaluate the needs of the meeting. M and C recommended an experiment in which the meeting would have spoken ministry by various members and attenders and provide pastoral care where needed for at least six months, and that the parsonage be rented during that time. After a large gathering of Friends met to consider this experiment, it was approved, with some standing aside. This 6 month period will be reviewed periodically through questionnaires, and a called session will be held to evaluate the Meeting’s vitality and spirituality. Over the past year Durham Friends Meeting is pleased and blessed that seven individuals became full members: some new and others by transfer. The statements and letters of these new members were an inspiration to all members. We also joyfully recognize the participation of 15 Young Friends; five will graduate from high school this year. We are inspired by the social concerns of our youth. Our average Meeting attendance is 40. We appreciate our pastor Doug Gwyn: his Sunday messages, leadership style, listening skills, scholarship, optimistic manner, observations, and sense of humor. Under the care of Ministry and Counsel, Doug has organized and coordinates a Pastoral Care Committee. Midweek worship, Sunday Adult Education, writing group and Woman’s Society help keep us connected and grounded. Hand-made baby quilts are given to families. There is an appreciation of being a part of the Society of Friends with its history and challenges. We continue to be blessed with our creative and adaptable youth pastor and Christian Education Committee. Wendy Schlotterbeck’s leadership of the teen trip to the Southeast was a fine example. The group visited Quaker centers in North Carolina and had queries for each place they explored. There are two Sunday School classes for children and youth, the younger one using Godly Play. The facilitators and their work with our children is soulful and appreciated widely. Our need is for more children to be involved in Meeting for Worship and Sunday School and for more adults to be continually learning about our faith and our history. We are making thoughtful choices about financial resources, facilities, and programs. We installed a metal roof for the parsonage and replaced our old outhouse with an insulated wall. A cell tower on our woodlot land is in process. We have welcomed community groups such as Twelve Steps and 350.org, and hosted a transgender meeting. Two workshops on Black Lives Matter were very much appreciated. Some are active in Quarterly Meeting and New England Yearly Meeting. We have a choir that sings at Easter and Christmas times, led by a fine musician. Our Christmas program took the form of a Latin American inspired Posada. This focused attention on migration and the experience of being “other” in our society. We each are learning, growing, assisting as able, and grateful to be part of this evolving spiritual community. The urgent worldwide and local human needs we see call us to educate ourselves and those nearby, as well as provide aid locally. Each year the loss of elder Friends reminds us of their valuable contributions to Meeting and how important it is to honor and respect life. We remember with gratitude two members who were a valuable part of the Meeting who have died in the past year. 2014 has been a year of transition for Durham Meeting. The physical change was re-arranging the benches in the Meeting room into a rectangle. Changes in pastoral leadership went from the end of one pastor’s regular service to her working with a former pastor to serve, then a new pastor arrived to serve us one-half time. We have been blessed by their contributions to our Meeting’s community. Several people contribute vocally in Meeting for Worship, in addition to prepared messages. We continue to be a semi-programmed meeting with hymn singing and an enthusiastic choral group which performs at various times. During this transition period, four well attended vision sessions were held to consider our present and future needs, resulting in the bench rearrangement, and several aspirations. Under the care of our Youth Minister we have a Sunday School program and a Youth Group. Several new attenders with children have added to the growth of the Meeting. The Youth Group has worked for some time to raise funds and plan a trip, scheduled to take place in February 2015. The Youth support a boy at the Kakamega, Kenya, Orphan Care Center. Some adults participate in a Sunday School class, a weekday evening Contemplative Prayer Group, and a Writing Group. An active Woman’s Society, affiliated with United Society of Friends Women International, meets for inspiration, education, business, and socializing. It prepared a meal once a month for a homeless shelter and supports financially projects in Belize, Ramallah, Kenya, Kickapoo Native American Center, and locally. The Meeting has individuals who are active in the area food and clothing bank program. Others are active in environmental issues. One of our young adults served as a Meeting summer intern helping with visitation and other pastoral duties, and left in August to serve as a teacher at the Ramallah Friends School, a two-year commitment. Trustees have paid diligent attention to property upkeep and improvement, harvesting trees on the property and the sale of land on Lunt Road. Some in our Meeting community are active in New England Yearly Meeting of Friends, with Friends Camp, sessions, committees, and retreats. We are thankful for Friends who live lives of commitment to God in their homes, Meeting community, workplace, local community, and with a concern for the world. Our journey as a spiritual community seeking God’s will among us was rich with the continuation of many beloved traditions and our commitment to a number of inner and outer concerns that we hold dear. We continued to be sustained by our traditions. Our Pastor’s spirit-led messages gathered and deepened our Worship. Music was an important part of each Meeting. Our Youth Minister and Christian Education Committee offered a vibrant and engaging program for the young people and children of the Meeting. Adult study remained an inspiring and sustaining practice for many. The Woman’s Society continued to be a strong and important part of our vitality. Through this group we constructed numerous baby quilts, held the annual yard and plant sale, provided a reading program for all ages, and offered financial support to many community and wider Quaker concerns. Peace and Social Concerns engaged with environmental concerns. Our library continued to provide a rich resource to the Meeting. Our spirits were nourished in additional ways. The contemplative prayer group was a powerful means of centering and deepening for those who participated. Community dinners and fundraisers, such as those for Lisbon Area Christian Outreach (LACO) and Kakamega, Kenya, Orphan Care Center, served to strengthen our friendships and build strong bridges among us. Ministry to those needing special attention provided a mutual benefit to all and served to deepen our relationships to one another. We were delighted to receive a number of traveling friends from Bolivia and Cuba this year. Care of worship was especially important this year, particularly when we received the news that our pastor, Daphne Clement, would be retiring in October. This drew us together to arrange an interim plan, and further deepened a movement toward exploring and visioning the emerging needs of the meeting. While we know our spirit is strong, we recognize that our numbers have diminished. We know that each of us carries the power of ministry, and we are drawn to find new ways to develop and share these gifts more fully. We desire that our corporate Light would shine more brightly in the larger community, encouraging others to more easily find us. As the year came to an end, we found ourselves on the cusp of new growth, bringing both a feeling of excitement and exhilaration and also a sense of caution and confusion about a future that will bring some form of change. We seek wisdom and strength for our journey, and so we call upon the One Who Knows All to watch over us, and we say: Divine Creator and Guide, help us to deepen our practice, awaken our insights, and remain true to Your Way, so that we might expand our vitality and feel Your Presence among us. Keep us steady and trusting of Your Wisdom. Greet us with patience each day, as we learn to listen and grow in love for You and for one another.